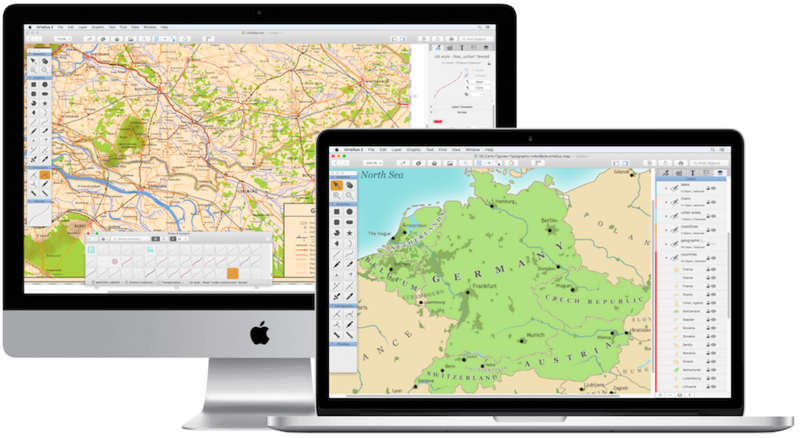 Ortelius Map Design Software for MacOS | Jill Saligoe-Simmel, Ph.D.
January 10, 2016 /in Cartography, Portfolio /by Jill Saligoe-Simmel, Ph.D.
Mapdiva was founded in 2008 by Graham P. Cox and Jill Saligoe-Simmel to empower people to design custom maps using extraordinary cartography tools on their Mac. We were frustrated by a lack of software to make custom maps without requiring you build a database first. We knew there had to be a better way. So with a focus on the user, we created Ortelius (named after the 16th-century cartographer, Abraham Ortelius). Ortelius is unique cartography software that meets the mapping needs of graphic designers, savvy public, historians, project managers, researchers, and people like you. Ortelius is a unique professional creativity app that’s a hybrid between a vector drawing program and a geographic information system (though Ortelius is decidedly not GIS). Ortelius adds tailored functionality for map design, such as connectable track tools, powerful style engine, library of expert styles & map symbols, and robust templates. If you’ve ever tried making a map in a standard drawing program, you know how tedious it can be. Or, perhaps you’ve lamented how difficult it is to make quality map graphics in a GIS. Ortelius automates many of the tedious tasks in manual cartography with a clear eye towards high-quality graphics, so you can focus your creative energy on content and design. Mapdiva also makes Artboard® the vector drawing software to create crisp vector graphics, logos, icons and illustrations. Artboard features “smart” objects, direct select tool, a powerful style generator and stacked styles that go way beyond simple fill and stroke, providing a wide range of spectacular effects. It delivers with over 1900 styles and clipart include a wide assortment of maps, shapes, color swatches, pictographics, floor plan, and flowchart graphics. Exclusively for macOS.